When you want to resign from your current teaching position, you have to make sure that you turn in a teacher resignation letter to the dean of the department or the principal of the school you are teaching at. You have to make sure that you are following the correct procedure when it comes to exiting from the school. Make sure you have a good idea about resignation deadlines and any clearances that you have to accomplish before you depart. Failure to follow proper procedures can have possible penalties to it that may damage your career. This is why you have to make sure that you are able to give proper notice in order to make sure that you avoid incurring penalties and you ensure that your next career adventure will go as smooth as possible. Give proper notice and submit your resignation documents in advance. This will give the employer enough amount of time to find someone who will replace you. You have the option to send your letter via email or by personally hand-delivering it to your boss. We would like to help you transition to your new career adventure in a smooth manner. We would like to start with your resignation letter. With that being said, we would like to share a couple of information regarding teacher resignation letter that we think you might find helpful. 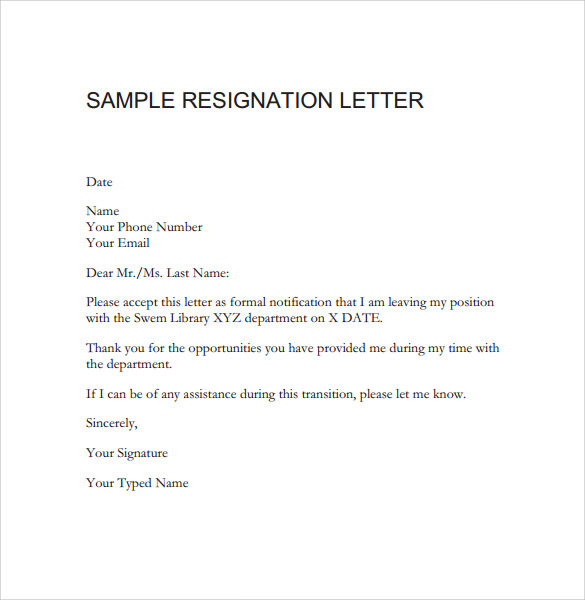 Plus, we have included sample resignation letters dedicated to teachers, both in PDF and Word Document file formats. You will find that the samples that we have are easy to download from this very article. Want to know more? Just keep reading! Leaving your teaching job, or any for that matter, is a very difficult decision to make. Another difficult task branching out from making this decision is coming up with the right words to say in your resignation letter. However, we want to assure you that there is no need for you to worry as we will guide you on how you can come up with a resignation letter that will give out all the necessary details that your employer needs to know about why you have to leave your job. 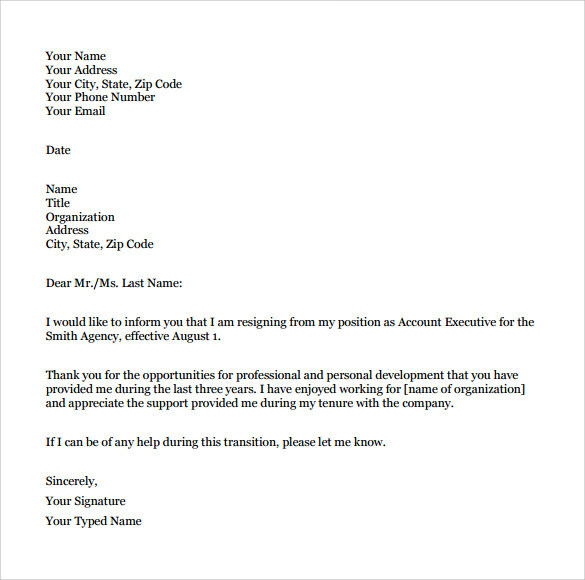 Your professional resignation letter is not the nicest document that your employer will receive but, no matter how much you might not want to do it, you have to do it. This part of the article will help explain what you need to know about writing your teaching resignation letter. Before we go to the writing part, we will give you a couple of things that you should consider in terms of how to properly resign from your teaching job. More often than not, teachers are subject to following schedules even when they want to resign from their job. 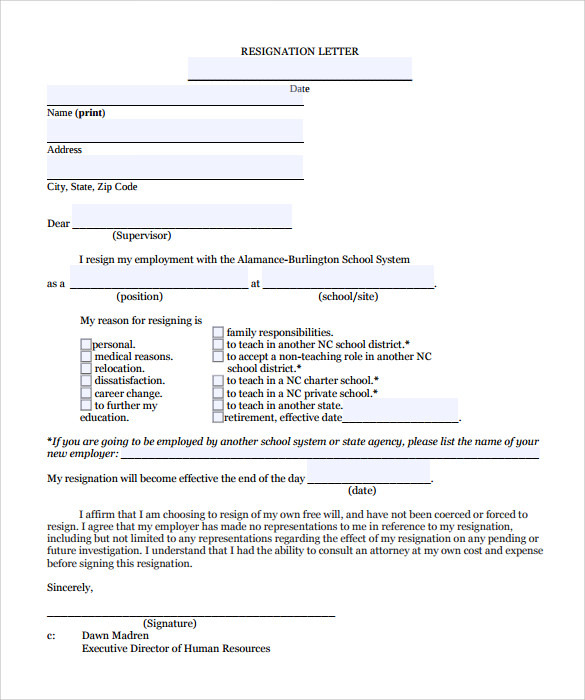 There are resignation deadlines that teachers need to follow, which means that if teachers have a plan of leaving their job, they should submit their resignation letter notice on or before the set deadline. It would be considered as good practice to know when the deadline would be as you do not want to be caught in an awkward position of sending your letter in an untimely manner. Another good practice that the school will definitely appreciate would be to hand in your resignation letters way ahead of the deadline. Doing a face-to-face meeting with your supervisor or the principal would be a good idea before handing in your resignation letter. You have to first make sure that you already have a signed or confirmation of the new job that you applied for. If you are planning on going for a rest, you should do your part of explaining why you will be doing so, either in person or still in writing; however, the former will always be preferred. Make arrangements to always speak with your head or the principal ahead of time. This will give them time to process your reasons and find a substitute teacher or a new full-time teacher to take over. While you are at the meeting, you might be tempted to give the headteacher a piece of your mind especially if you are not in good terms with him/her. However, this would be something that you would definitely want to avoid at all times. You do not want to burn any bridges and you should also consider the feelings of the other party. The teaching profession is quite a small world, so people would know people and you never know who knows the headteacher or if you will ever run into him/her again. Handle yourself in a professional manner and do what is expected from someone who is in a respectable career. You will find out more about avoiding disrespectful on What to Avoid When Writing Your Resignation Letter. Need more tips on how to properly resign from your job? You can check out our article about The Dos and Don’ts of Proper Resignation to find out more! Will Emailing the Resignation Letter Be Good Enough? Emailing your resignation letter is also not a bad idea. However, handing in a letter is highly preferred. True enough, an email is a legal way of giving notice to your employer, it will still be recommended that you take your time with writing a resignation letter. If you would opt to go for emailing your letter, you can check out Sample Resignation Email Letter Templates to Download for more reference on how to write email resignation letters. 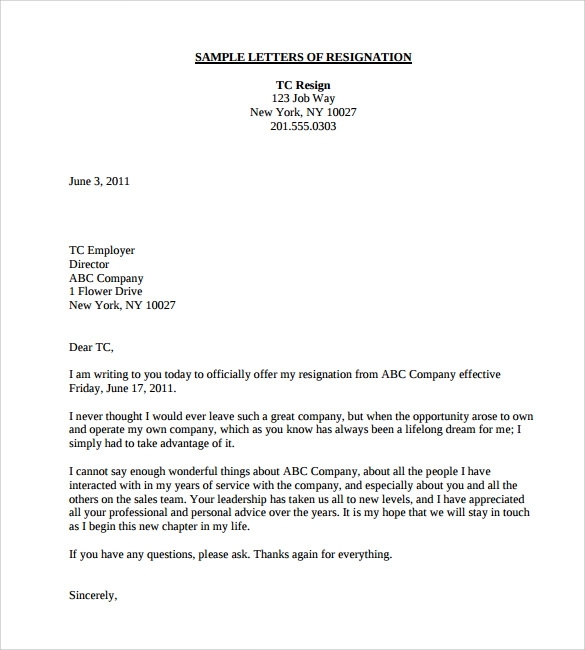 What to Include in a Resignation Letter? You want to make sure that you have covered all the bases when it comes to your resignation letters. It needs to be clear and be free of any confusing statements and statements that may be deemed as unprofessional and unnecessary. When it comes to drafting your teaching resignation letter, you want to make sure that you include your intent to end your employment, the date you want the resignation to become official, and why you are leaving your job. Make sure that you maintain a positive tone as you will be using the school as a reference for your future career endeavors. Express gratitude and appreciation for the opportunity you were given whether or not your experience with the school is pleasant or otherwise. The more positive and thoughtful your letter seems to be, the better your chances of ending your relationship with the school on a good note and the higher your chances of getting a good recommendation letter. Again, stating any unpleasant experience you had while you were in the school is not recommended. Just stick to the positive ones and focus on these. So what else is included in a teaching resignation letter? Formal Letterhead. You want to make sure that your personal details and the details of the person you are addressing the letter to are reflected on the letterhead. The date when the letter has been drafted should also be included. You may check out Sample Professional Letterheads for reference on how you can make these a staple in your professional stationery. Your personal details will include your name, your complete current address, and your contact details. The details of the recipient will include complete name, position, the name of the school, and the complete school district address. Salutation and Introduction. Your salutation should embody the fact that you respect the person you are writing to. Make use of the recipient’s last name such as Dear Mr. Faulkerson. For the introductory paragraph, make sure that it is brief and straight to the point. Inform the recipient directly that you are resigning, the position you are resigning from, and when your proposed last day of work will be. If you wish to leave during the middle of the term, make sure that your reason is valid and make sure to explain it properly. The Body of the Letter. You can opt to explain everything in detail. Describe why you have to leave your current teaching position. As mentioned earlier, make sure you focus on the positive aspects of your teaching experience as this will go on the permanent employee records of the school. Demonstrate gratitude and you will be rewarded with a good recommendation letter for your next teaching gig or your future career endeavors. Concluding paragraph. Write a concluding paragraph mentioning that it would be okay for you to be contacted via email or via mobile. Signatures. Make sure that you affix your signature in your letter. Leave a couple of spaces right after the ending greeting for your signature. Make sure that your signature goes on top of your typed name. If you need more tips about writing a resignation letter, you can go to our article Quick Tips in Writing a Resignation Letter.